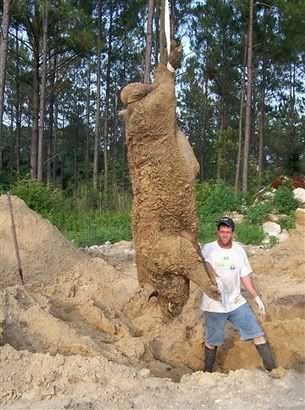 Chris Griffin, 31, poses beside the half-ton wild hog he shot near Alapaha, Ga., in a Thursday, June 17, 2004 photo. Hogzilla, a near-mythical monster hog that roamed south Georgia, is about to get a little bigger. An independent filmmaker is producing a horror movie about the super swine called 'The Legend of Hogzilla,' and has even enlisted the beast's killer on the set as an adviser. I surely would hate to bump into that beastie on a narrow forest path. That movie just might be scary.